Connacht's injury woes may continue, but so do the victories in the European Challenge Cup, and coach Pat Lam will be hoping his injury-hit squad can lift themselves one more time to see off Newcastle before the break. Sunday's pool one fixture in Newcastle is the second of the pre-Christmas back-to-back European games, and a win for Connacht would almost assure them of qualifying for the quarter-finals. While Lam can expect to receive a warm welcome from his former club where he enjoys iconic status, there ends the Falcon hospitality, and as a result Connacht are preparing for an intense battle. "It's quite a massive game for us where we sit," says Lam. "If we get a win this weekend away from home it sets us up nicely. We can put it away and get back to the Pro 12 in a strong position, but a defeat is a door for the other team. We have to focus all our energy on what we have." Standing in the way is a Newcastle side and its coach Dean Richards who were stung by a young Connacht outfit at the Sportsground. The director of coaching, believing Connacht’s 4346 crowd had helped swing a few penalties home side's way, is now relishing the opportunity to settle the score. As a result Lam says this fixture will test Connacht's mental strength. "These games are always interesting, like test matches. There is no surprise element, and now, when you go into their back yard, it is a really good mental test and part of all players' development. It is about what we can do better this week knowing they know what is coming." Connacht 's cause has not been helped by European rugby's governing body that turned down Lam's appeal to add two extra backs to the squad ahead of Sunday's return visit to Newcastle. With some 11 backs sidelined with injury, Lam had sought to include Academy players, fullback Ciaran Gaffney and outhalf Conor McKeon, but the EPCR cannot "bend" its rules. "No conversation [with EPCR], just an email," says Lam. "No, the rules are the rules, and we only had the one change available in the front row." Lam has been forced to utilise that option with prop Denis Buckley expected to be sidelined for eight weeks after ankle surgery, and has registered another Academy player, Saba Meunargia. But having also lost Dave McSharry with concussion, - last weekend's replacement lasted just 30 seconds on the pitch - Lam continues to struggle with his back line options. "It's not great. Hopefully we will get some more guys [back], but if not we will have to go with just 21 or 22 players. Hopefully we will have 23 at the end of the week, and if not, it is just the way it is - 21, I remember we used to do it in the old days. We just have to get on with it. "There are things you can control, some you cannot, and we have a big game this weekend." With 10 backs fully fit, including Craig Ronaldson who had returned from concussion, Lam is hoping fullback Tiernan O'Halloran (quad ), who signed this week for another two years, and Matt Healy (calf hematoma ) will be good to go, while lock Andrew Browne (hand ) and Eoghan Masterson (thumb fracture ) are also available for selection. However he will not risk Bundee Aki (ankle ), John Muldoon (calf ), and Ronan Loughney (back ) if they have "continuing niggles", particularly with the pending visit of Ulster on St Stephen's Day. Openside Jake Heenan, not part of the registered European squad, also returned to full training this week after shoulder reconstruction, and could be in line to take part in the Christmas interprovincials. "Hopefully Jake can get back in there. He has returned to full training and the Return to Perform people have done a good job in progressing his training in the gym, around the field, and his contact training. There is a long way to go, and deliberately we will not rush him, but we will make sure he has all the boxes ticked off." Ronaldson, O'Halloran and Healy would add experience to the youthful back line, if all are fit, while Browne and Masterson's return will boost Connacht's forward options, particularly against a Newcastle pack which prides itself on its physical prowess. However Lam has also applauded his youngsters for their gutsy 25-10 victory last Friday which keeps them top of pool one with three wins from three, while Newcastle, Brive and Enisei each has one win. "It was a big week if you look at the six Academy players and a lot of players who had not had much game time. I was so pleased after the game, it could potentially have been a disaster for us, but it's in line with a lot of things that have happened this year. "The statement that came through from the players' review was that we were comfortable, but not clinical, and that sums it up, and we want to be clinical in everything we do." However Connacht did produce a gritty performance to maintain the lead of their European pool. it was all the more rewarding given that Connacht, having lost 18 players to injury, suffered another setback prior to kick-off, losing fullback and captain Tiernan O'Halloran. it resulted in wing Matt Healy moving to fullback, having also played scrumhalf the previous week against Cardiff. However Connacht, who always had their noses in front, stayed the distance, seeing off the Falcons in the final 10 minutes when they were a man down. 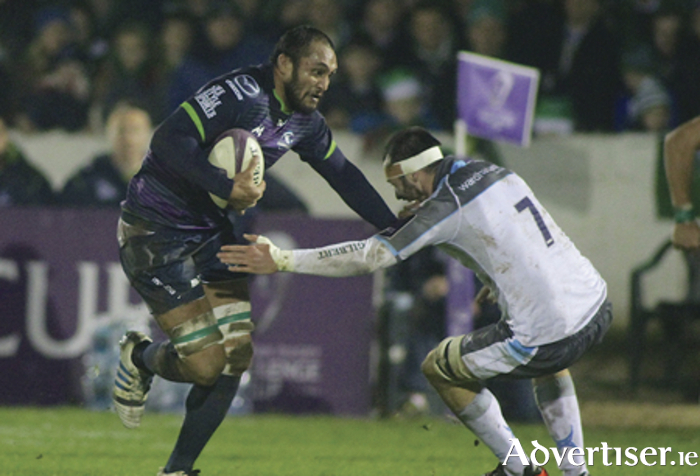 Connacht had outscored their opponents by three penalties to two in an opening half marked more for endeavour than clinical edge from both sides. Opening with intent, Connacht were rewarded with an early penalty - Jack Carty kicking the three-pointer from the 22 after the Falcons strayed offside. Although the visitors started to test the home defence, it was Carty who stroked over a second penalty from the 10m line when Matt Healy was taken out late on the counterattack. With both sides looking to keep the ball in hand, the Falcons big pack were able to gain ground, keeping Connacht on their toes until good work at the breakdown from Finlay Bealham forced a relieving penalty. However Connacht continued to dominate territorially, but were unable able to make it count on the scoreboard, and a poor pass proved costly, allowing the visitors to secure possession and against the run of play attack down the wings. The result was a penalty for the Falcons after Connacht were penalised defending their attempted rolling maul, and outhalf Craig Willis stroked over the three points after 34 minutes. Connacht responded in kind - their backs stretching the Falcons' defence for Carty to give his side a 9-3 lead at the break - and within seven minutes of the restart, he extended the lead with this fourth penalty after superb work by Peter Robb at the breakdown. While Willis missed a penalty minutes later, the visitors grabbed the initiative and started to pile on the pressure, but once again Connacht produced a superb scrum to win a penalty. It was temporary relief, however, as the Falcons eventually scored a try from a rolling maul, and Willis added the extras to bring them within two points. At that stage the visitors must have fancied this chances, but Connacht refused to buckle. Carty pushed the lead out to five on 62 minutes, having missed a kick from the same position some minutes earlier, while Catterick missed a straightforward effort on 68 minutes when Connacht's Rory Parata was sinbinned for a deliberate knock-on. Another penalty from Carty provided some much-needed breathing space with the home side down a player. It galvanised Connacht and they took control, edging closer to the try line until Danie Poolman opted for a grubber some six metres out, and raced through to touch down for the winning try five minutes from the final whistle. Man of the Match Carty added the conversion to put the game beyond Newcastle's reach. Connacht Rugby: M Healy, N Adeolokun, R Parata, P Robb, D Poolman, J Carty, C Blade, F Bealham, J Harris-Wright, N White, A Muldowney (cpt ), U Dillane, S O'Brien, J Connolly, G Naoupu. Replacements, R Ah You for White and S Delahunt for Harris Wright (54m ), D Qualter for O'Brien (67m ), S O'Leary for Healy (72m ), C O'Donnell for Bealham (77 ), D McSharry for Healy (79m ). Page generated in 0.0855 seconds.